Advanced Vehicles at Clay Cross, Derbyshire have been building quality van conversion minibuses for many, many years mainly, though not exclusively, on behalf of primary van manufacturer’s dealers, particularly Citroen. Advanced has always adopted, as far as possible, a philosophy of using its own equipment in the conversions. This can include fibre glass mouldings, glazing, seating, M2 tracked floors and even powered doors. 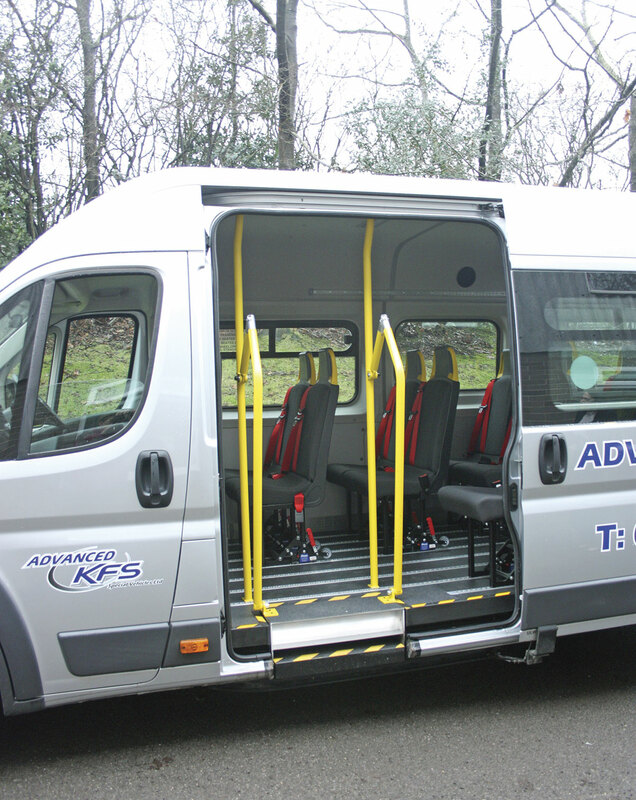 A couple of years ago Advanced Vehicles merged with KFS Specialist Conversions of Andover to form Advanced KFS Special Vehicles Ltd. The company is run by four men who have years of experience in converting vehicles. Ian Knight who is the Managing Director; Gary Robinson who is Production Director Clay Cross; Steve Elwell who is Sales and Marketing Director and Mark Adams who is Production Director, Andover. In the past, Ian, Steve and Gary had worked together with all three having been part of the Rohill team. When Rohill closed, Ian Knight set up KFS whilst Gary Robinson went off and with Rob Miller founded Bluebird Vehicles up in Scarborough. Steve Elwell set up as a Sales Consultant and one of his clients was KFS. Later Steve became part of the management team at the Andover concern. Whilst at Scarborough, Gary with Rob Miller bought Advanced Vehicles privately and later, when Gary decided to sever his connection with Bluebird, he became sole owner of Advanced. A chance meeting between Ian Knight and Gary Robinson brought about the merger between Advanced and KFS. Ian Knight was struggling to recruit suitable skilled staff in Andover and urgently needed to expand production of his range of low-line commercial vehicles. Gary Robinson had spare production capacity and in the Derby area, because of its long history of vehicle building particularly for the rail industry, had no great difficulty in finding extra skilled staff. 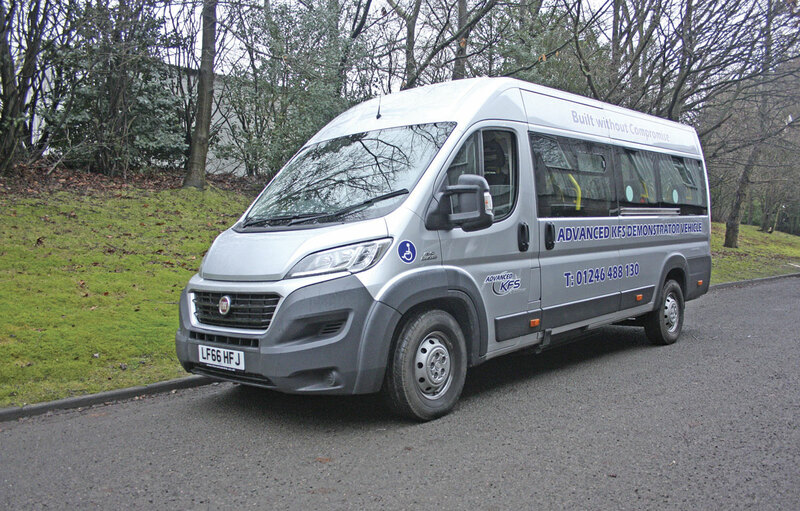 These days, the massive Advanced facility builds both commercial vehicles and minibuses as well as continuing to produce components for both product ranges. The former KFS facility at Andover continues to produce commercial vehicles, primarily specialist low-line vehicles including car transporters and local authority maintenance vehicles. In the past KFS have also produced low-line accessible minibuses which were marketed under the Freedom and Liberty banners. These are not currently being produced. The merged company has now developed a new flat floored 16 seat wheelchair accessible minibus. 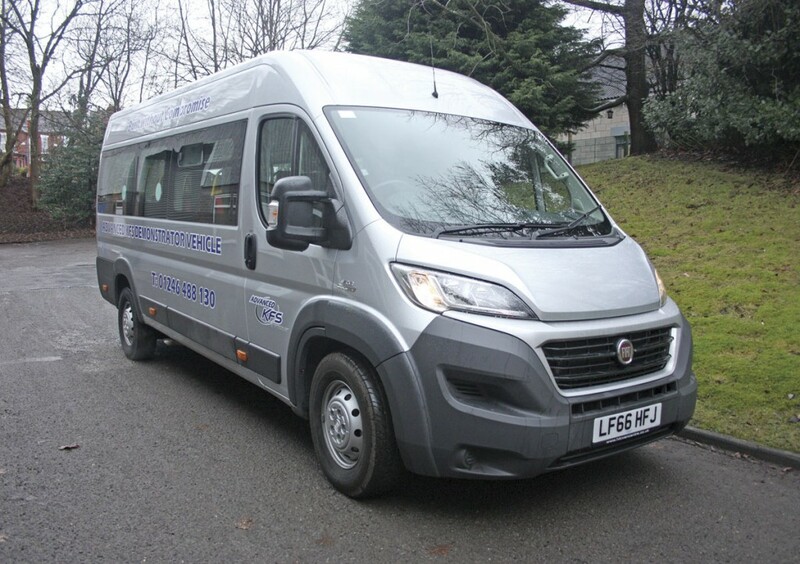 The vehicle uses as its base a Fiat Ducato Maxi L4H2 HDI van. This translates into a vehicle with a wheelbase of 4.035m; overall length of 6.363m; width of 2.05m and a height of 2.524m and a gvw of 4.25tonnes. The front wheel drive vehicle is fitted with a 2.3litre Fiat four cylinder, direct injection, turbocharged diesel engine and meets European emission standards The engine produces 130bhp at 3600 rpm and has a maximum torque output of 320Nm available across a wide speed range from 1800 to 2600 rpm. The engine is matched to the six speed automated Comfort-Matic (Agile) transmission or a six speed manual gearbox. Suspension is a Ferguson strut system with steel springs and hydraulic dampers at the front and steel springs at the rear. Steering is powered. Access to the vehicle is via the nearside sliding door. 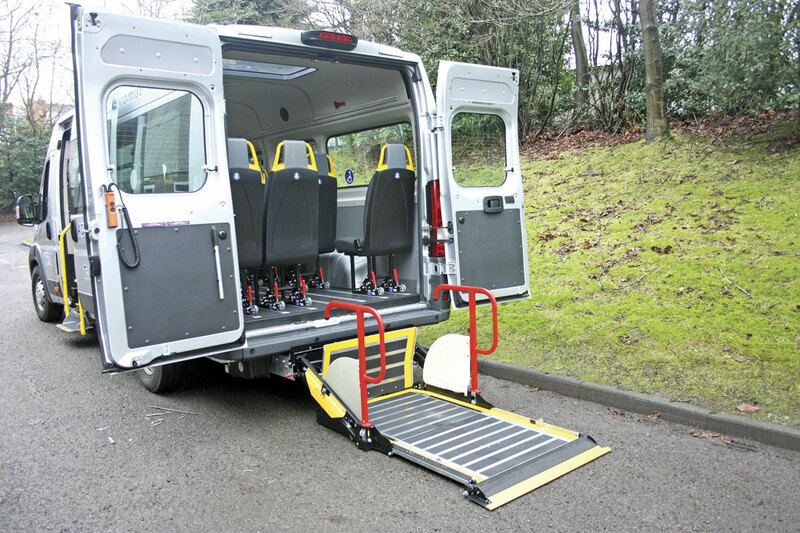 There is a two step entry but for easier ascending the vehicle is fitted with a fold out step system complete with handrails. This provides a much lower first step and a much safer method of entry. The system was designed by Advanced KFS and they also manufacture it. Inside the vehicle, there is a flat, plywood, M2 tested floor produced by the company that is trimmed in non-slip vinyl. The floor is tracked for seat fixing and wheelchair clamping. 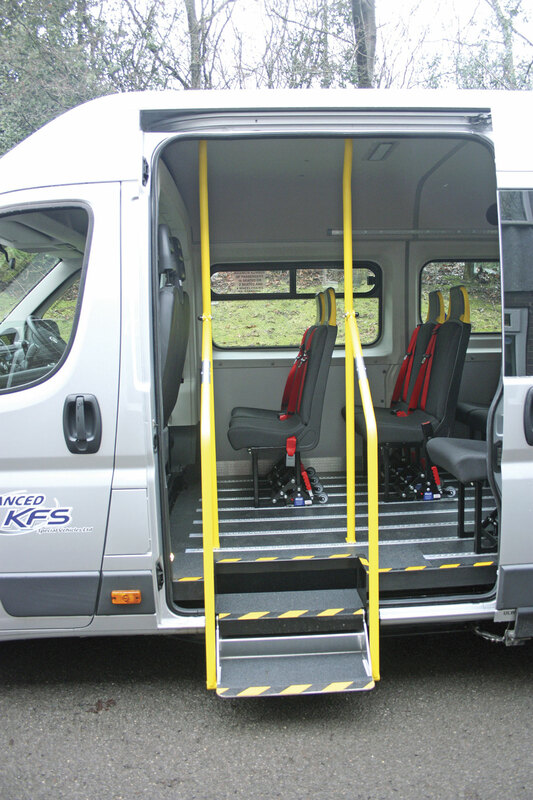 The vehicle is fully glazed with bonded windows that are also produced by Advanced KFS themselves. Two of the windows incorporate top sliders. The windows are trimmed internally with one piece GRP mouldings. Below the windows the sides are panelled using grey GRP units. The ceiling is panelled in soft trim units. All internal trim is produced by Advanced KFS. A glazed roof hatch is part of the specification. Lighting uses a dual circuit system providing passenger courtesy and general saloon lighting with a night driving setting. Additionally there are special down lighters over the entrance and at the rear for wheelchair loading. 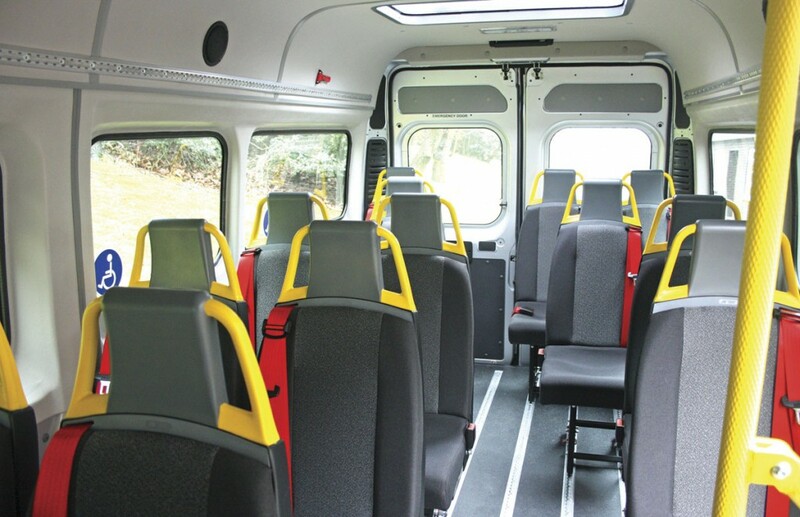 Within the saloon there is seating provision for 14 seats which are mounted on NMI quick release fittings. The seats are the former Richards and Shaw Urban design which Advanced bought some years ago. The seats are trimmed in cloth and they are fitted with lap and diagonal automatic belts with height adjustment. The vehicle can alternatively carry up to four wheelchairs. There are an additional two passenger seats in the cab area. 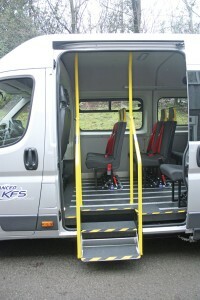 Wheelchairs are loaded through the full height rear doors which fold back flat against the rear of the vehicle. A PLS underfloor cassette type lift is provided for raising and lowering the wheelchairs. 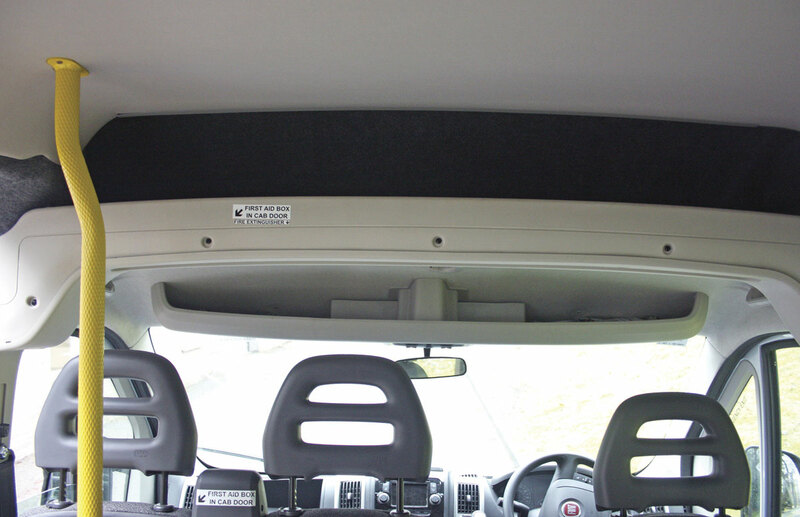 The vehicle benefits from a comprehensive heating and ventilation system together with air conditioning. 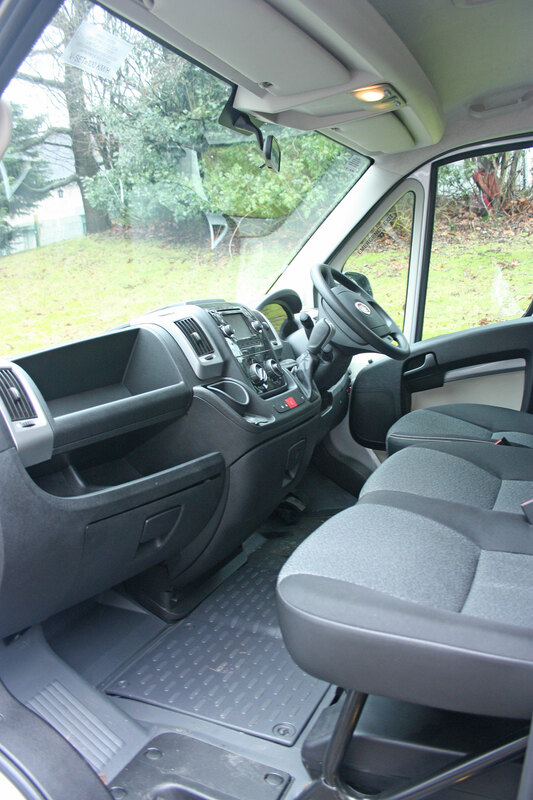 The cab is essentially Fiat Ducato and is well appointed with fully adjustable driver’s seat, electric windows and electrically adjustable mirrors. 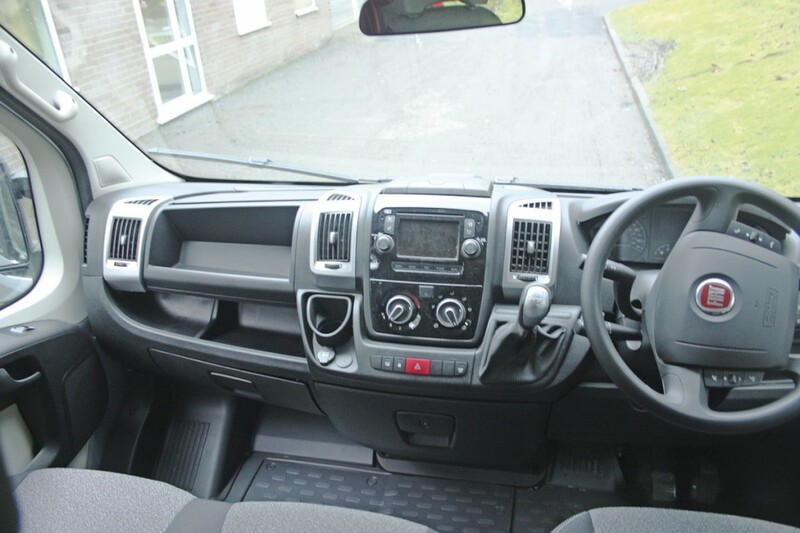 The vehicle is also fitted with a reversing camera and an audible reversing bleeper, It benefits from a radio system which feeds to speakers in the saloon, a U connect sat nav with 5in touch screen, USB sockets and mobile phone connection facilities. The quality of the build is very high as is to be expected from this well regarded producer. Although the main model offered is the Fiat Ducato, it is also available on the Citroen Relay, the Peugeot Boxer and the Iveco New Daily.